Forward / reverse assembly for go-karts. This version was used on select Chinese manufactured carts such as Hammerhead, Trailmaster, and American Sportworks that used a 6.5 HP engine. This kit could be modified to use with most 5-6.5HP go karts. Q: Will this kit work on a yerf dog 3203 with a 6.5hp 212cc predator engine? Q: I have a 13 hp 301cc Predator series engine for a go kart I am rebuilding. My question is is this kit compatible with this engine? And would I need any other parts such as a torch converter or would it work with Just the engine and the chain? A: This kit is designed to work with a CVT on a 150cc GY6 style engine, not like your OHV 13HP engine. 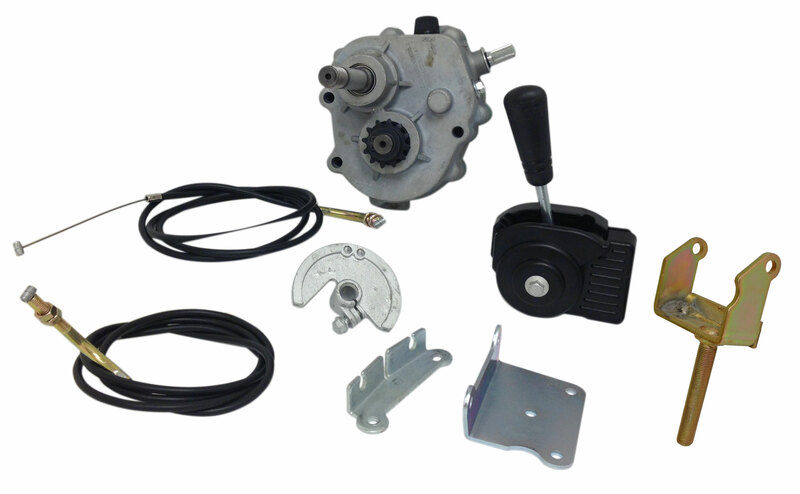 To equip your engine with a reverse you would need a to pair this Comet Forward / Reverse Gearbox with a 40 series or 44 series torque converter setup.